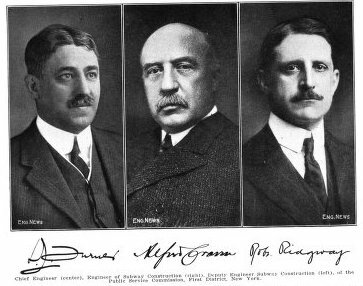 Daniel L. Turner, Deputy Engineer Subway Construction (left); Alfred Craven, Chief Engineer (center); Robert Ridgway, Engineer of Subway Construction (right), of the Public Service Commission, First District, New York. Although this article was prepared by the editors of "Engineering News," it is made a part of the series of articles by Mr. F. Lavis on the construction of the new subway and elevated lines in New York City, now running in this Journal in order that the presentation may be complete as a whole. Few people, even in New York City, realize the gigantic task of constructing 230 miles of rapid-transit lines into and through the heart of the most congested districts of New York City; a system of elevated and underground electric railways of far greater mileage and more complete in every respect than any similar system in the world. This work is being carried on under the direction of the Public Service Commission of the First District of the State of New York, which besides having direct charge of the construction of these new rapid transit lines also supervises the operation of all Public Utilities companies, inspects and passes upon equipment, services and rates of all existing transportation lines, whether surface, rapid transit, interurban, or regular steam railroads, etc., as well as gas, electric light, power and telephone companies. The chart, p. 729, shows graphically the organization of the engineering staff engaged in subway and rapid transit design and construction and incidental work. Not shown on the chart is an Electrical Engineer, the head of a separate bureau of some 60 engineering employees, a bureau of gas and electricity, and a transportation bureau, each employing several engineering inspectors. The titles of the various employees and the salaries of each grade are shown in a table accompanying the chart. Organization chart of the engineering staff of the Public Service Commission. Organization chart of the sewer division of the Public Service Commission. Complex as the organization appears, it is founded on strictly military principles. There are two grand divisions, roughly the groups on the right and left respectively; (1) the actual supervision of construction, under Robert Ridgway, Engineer of Subway Construction; (2) the administrative and executive work, design, subsurface structures, estimates, etc., under Daniel Lawrence Turner, Deputy Engineer of Subway Construction. Through these lieutenants all the various subordinates report, except the Electrical Engineer, who reports directly to the Chief Engineer. To each subordinate is designated his explicit authority and responsibility, to which he is held strictly accountable. Efficiency Records. To foster enthusiasm and assure promotion to the deserving, a quarterly record is kept of each employee's ability rating and efficiency rating as determined by his immediate superior. Each rating has an established value which is added to or subtracted from the employee's efficiency percentage. The system is quite elaborate, but has been in service for more than four years and is giving eminent satisfaction. It is the aim of the Chief Engineer to fill all the responsible positions by promotion, and whenever a vacancy occurs, promotion examinations are held, which are open only to those who have served in lower positions for a predetermined period of time and have maintained an efficiency record of at least 60%, for a given period. Promotion Examinations. An example of such an examination was one held a year ago for the position of Assistant Division Engineer. This was open only to Assistant Engineers and Designers of Grade 10. The subjects of the examination and the relative weights were: (a) A paper on some subject relevant to the work of the applicant, weight 1; (b) efficiency, weight 3. The paper was to be typewritten and illustrated with drawings or photographs, and accompanied by an affidavit to the effect that it was an original composition of the applicant. The practicability of such a test is readily appreciated and illustrates how an enthusiastic, loyal and efficient staff may be built up and maintained, while still keeping strictly both to the letter and the spirit of the civil-service laws. Chief Engineer. In general charge over all work under the Engineering Department, including the preparation of plans for and the construction of subway and elevated work by the City, and the approval of plans for and supervision over the construction and equipment of subway and elevated lines by the operating companies under the Dual Contracts, aggregating a total cost of nearly $350,000,000. Engineer of Subway Construction. Deputy having general supervision in the field over the construction of all subway and elevated work prosecuted by the City or companies, including general supervision over the five field divisions and the Divisions of Sewers and Inspection of Material. Acts as Chief Engineer in the absence of Chief Engineer. Deputy Engineer of Subway Construction. Deputy having general supervision over all administrative and organization work, including general supervision over the general office and Divisions of Designs, Subsurface Structures, Track Work and Estimates, and the Electrical Engineering Division with respect to new subway work. Acts as Chief Engineer in the absence of the Chief Engineer and the Engineer of Subway Construction. Principal Assistant Engineer. In charge of the Division of Designs. In direct charge of the designing of all subway and elevated work and preparing contracts and detailed plans with respect thereto, and also examines and passes upon construction plans for work prosecuted by the operating companies. Division Engineer. In direct charge of a division of construction work in the field covering subway and elevated construction. Has charge of construction work amounting from $30,000,000 to $35,000,000. Division Engineer of Sewers. In charge of Sewer Division, having direct charge of the preparation of designs and plans and supervision in the field over all sewer reconstruction work resulting from subway or elevated construction. Engineer of Subsurface Structures. In charge of the Division of Subsurface Structures. In direct charge of the preparation of all designs and plans covering the reconstruction and readjustment of all sub-surface structure work in connection with the construction of subway and elevated lines. General Inspector of Material. Has direct charge over the inspection of all materials of construction. Senior Assistant Division Engineer. In charge of administrative work of a field division, under the Division Engineer. Acts as Division Engineer in the absence of Division Engineer. Assistant Division Engineer. In direct charge of a subdivision of field work under the Division Engineer consisting of four contract sections of subway or elevated construction, covering work amounting to from $10,000,000 to $12,000,000. Assistant Division Engineer. In charge of Estimates Division, under the Deputy Engineer of Subway Construction, having direct charge of the compilation and preparation of Chief Engineer's determinations with respect to the cost of construction and cost of equipment of all railroads constructed by the City and by the operating companies under the Dual Contracts and Certificates. Senior Designing Engineer. In charge of administrative work of Designs Division, under Principal Assistant Engineer. Acts as Principal Assistant Engineer in the absence of Principal Assistant Engineer. Designing Engineer. In charge of a subdivision in the Designs Division, under the Principal Assistant Engineer, having direct charge over the designing of subway and elevated work and the examination of designs and plans prepared by the operating companies. Assistant Designing Engineer. Assistant to Designing Engineer in the Designs Division. Acts as Designing Engineer in the absence of the Designing Engineer. Designing Architect. In direct charge of the architectural design in connection with subway and elevated work under the Principal Assistant Engineer. Senior Assistant Designing Architect. In charge of administrative work in connection with designing, under Designing Architect. Acts as Designing Architect in the absence of Designing Architect. Assistant Designing Architect. In direct charge of a subdivision, under the Designing Architect, in the designing work and the examination of designs and plans prepared by the operating companies. Assistant Engineer. In direct charge in the field of the details of construction of one contract section of subway or elevated work, under the Assistant Division Engineer, approximating $1,000,000 to $3,000,000 in cost. Junior Engineer. Has charge of the administrative work of a contract section or of a field party giving lines and grades, under Assistant Engineer. Designer. In charge of a squad of Draftsmen and Junior Assistants in computing and preparing designs and plans, under Assistant Designing Engineer. Draftsman. Does detail work in preparing designs and plans, under Designer. Architectural Designer. In charge of a squad of Architectural Draftsmen and Junior Assistants in computing and preparing architectural designs and plans, under Assistant Designing Architect. Architectural Draftsman. Does detail work in preparing architectural designs and plans, under Architectural Designer. Junior Assistant. Acts as a member of field party giving lines and grades, under Junior Engineer, or does detail work on tracings, plans. etc., under Draftsman or Architectural Draftsman. Chemist. Makes chemical analyses of materials under the General Inspector of Material. Cement Tester. Tests cements, under the General Inspector of Material. Inspector of Steel. Inspects the manufacture and fabrication of steel at the mills and shops and the erection of the steel in the field, under the General Inspector of Material. Inspector of Conduit. Inspects the manufacture of conduits, under the General Inspector of Material. Chief Clerk. Secretary to Chief Engineer. Has direct supervision over Engineering Department general files and clerical and stenographic work in the general office, under the Deputy Engineer of Subway Construction. Assistant Chief Clerk. Has charge of filing and clerical work under Chief Clerk. The lowest engineering grade is that of Junior Assistant, with an entrance salary of $901, with promotion to $1200 without change of rank. By passing the requisite examinations and fulfilling the efficiency conditions the Junior Assistant is eligible to the position of Junior Engineer at a salary of $1201 to $1800, or to the same rank in the drafting-room force, and so on; so that a capable man is assured of reasonable progress as his value increases. The Junior Assistant corresponds to the rank of axman, rodman, chainman, etc., in other city work, but is better paid. Division Organization. Each field division in itself requires an elaborate suborganization, as shown in the chart, p. 729, the organization chart for the sewer division will also serve as an example to illustrate how the military scheme is followed out in more detail. There are at present five field Division Engineers, each with such a semi-independent organization as shown. Each field division comprises approximately $25,000,000 to $30,000,000 in work, the division being so made rather than to contain a certain mileage or a geographical district. The field divisions are subdivided as follows: three subdivisions, each in direct charge of an Assistant Division Engineer; each subdivision into four sections, each comprising a normal contract of from $1,000,000 to $3,500,000, each section being in charge of an Assistant Engineer. The sections, like the divisions and subdivisions are groups of construction work of approximately the same character or cost, rather than divisions of length. Each Assistant Engineer has, under the full organization scheme, four Junior Engineer assistants, and the four Junior Engineers have five Junior Assistants, the lowest engineering grade on the staff. A section usually covers a distance of from 2000 to 3000 linear feet of trackway. Besides the salaried engineering staff of each division, there are about two masonry inspectors of construction to each section who are paid $4.50 to $5.50 per day, and who are not included in the organization scheme. The inspectors report to the Assistant Engineers in charge of their respective sections. A similar scheme of subdivision exists in the office divisions of inspection of material, subsurface structures, station finish and estimates, and the divisions of design and of sewers. The various designers and draftsmen are divided into groups and squads in charge of Division Engineers, Assistant Division Engineers, Designers, etc., with ranks, grades and salaries corresponding to the field positions. Positions such as the one previously noted for Assistant Division Engineer are usually open to both field and office men, so it is possible for a man to be promoted from office to field, or vice versa. Work of the Engineering Staff. It is almost impossible within a brief space to give an adequate idea of the breadth and scope of the engineering work the Public Service Commission's engineers are called upon to perform. The rapid-transit work alone requires careful surveys of the streets and subsurface structures, the examination of buildings before and during the construction of subways on account of the possibility of damages, the preparation of contract and detail plans, the examination of steel plans, the testing and inspection of materials such as cement and steel at the mills where they are manufactured, the close supervision of the construction work as it progresses, the preparation of the estimates upon which the payments to contractors are made, the redesign and construction of sewers and other subsurface structures, the passing upon all the equipment for the operation of the new railways, and other problems too numerous to mention. Besides these there are the disposition of complaints, the maintenance of existing subsurface structures and street traffic to be looked after during the period of construction. Preliminary survey of streets to be traversed. Preparation of route maps and resolutions. Application to and approval by the Board of Estimate and the Mayor. Consent of property owners or of the Appellate Division. Survey of surface and subsurface structures. Preparation of form of contract. Public hearing on form of contract. Approval of form of contract by Corporation Counsel. Advertisement for and receipt of bids. Acceptance of bids and submission to Board of Estimate for approval and appropriation. Execution of contract and commencement of work. Preparation of working plans and examination of the working steel plans. Arbitration of disputed items of cost. The rapid-transit construction work cannot be compared with the work of any other commission in this country except the Boston Rapid Transit Commission, but it must be remembered that besides construction work, the Public Service Commission of the First District also performs the regulatory work of supervising all the public services of the Greater New York District, the transportation, gas and electric businesses of which amounts to about 20% of the total for the entire United States. The number of passengers carried annually on the existing transportation lines in the city is some 60% more than the number carried by all the steam railways of the country. Electrical Engineer. The Electrical Engineer, Clifton W. Wilder, maintains a bureau, not shown on the organization chart, employing about 60 engineering assistants. This work is divided into four main divisions as follows: (1) Passing on all plans for the electrical equipment; (2) cost accounting of equipment; (3) supervision of operation of the existing lines; (4) valuation of public-utility corporation properties. On the first two divisions, as a part of the new subway construction, he reports to the Chief Engineer, but on the supervision of operation and valuation work he reports directly to the Public Service Commission as its Electrical Engineer. He has one Principal Assistant Engineer and six Assistant Engineers. The supervision of operation includes such work as investigating complaints of equipment, accidents, regular inspection of equipment, special investigations, etc. The scheme of an engineering organization plays only a small part in its successful operation. Much depends on the men who are at the head of it. The Chief Engineer of the Public Service Commission is himself the kind of man to appreciate the importance of personality in the efficient working of the splendid organization he has achieved; and he not only takes a kindly interest in his many subordinates and makes himself accessible to them, but has so designed the working of the entire organization as to promote individual effort, enthusiasm and loyalty. Alfred Craven. The Chief Engineer of this great organization, which at present includes approximately 1000 engineering employees (and it is growing), is a descendant of a distinguished family of naval officers and engineers. He was the son of Rear-Admiral Thomas T. Craven, who served throughout the Civil War and was afterward Commandant of the Mare Island Navy Yard. He is a nephew of Alfred W. Craven, Chief Engineer of the old Croton Aqueduct, builder of much of the original sewer system of lower Manhattan, the Central Park Reservoir, and many other historic engineering works in and about New York City. Alfred Craven was born at Bound Brook, N. J., Sept 16, 1846. At 17 years of age, at the height of the Civil War period, he was appointed to the United States Naval Academy, then conducted at Newport, R. I. Later, after the coming of peace, the Academy returned to Annapolis, Md., where Mr. Craven was graduated in 1867. After a few years' service, and while on the Pacific Coast, he retired from the Navy with the rank of Master, to devote his life to engineering. In 1871, he joined the California Geological Survey. Later, he was engaged in irrigation work in the Sacramento and San Joaquin Valleys, and then began private practice in Virginia City, where he established a reputation as a mining engineer in connection with the development of the famous Comstock lode. On this work he was associated with Adolph Sutro in the construction of the well known Sutro tunnel. Mr. Craven returned east in 1884 to become Division Engineer of the new Croton Aqueduct for the additional water supply for the City of New York, where he was in charge of a construction division and later of the Carmel and Titicus dams and reservoirs. On this work he established an enviable reputation for rugged honesty in the midst of graft and corruption in the part of contractors and politicians. After some straightforward and unimpeachable testimony before a legislative committee, an incensed politician is to have told Mr. Craven, "You've done the last stroke of work you ever will do on this job." Whereat, Mr. Craven is said to have quietly replied, "I'll be here when you're gone"-- which proved correct, for the Aqueduct Commission was subsequently reorganized by Mayor Hewitt, and men of a caliber to appreciate honest service were appointed. For eleven years, Mr. Craven was Division Engineer on the Croton Aqueduct and Reservoirs, and then in 1985, he was placed in charge of the construction of the Jerome Park Reservoir. Following a change in the Engineering Staff of the Commission, the plans of the work were altered in such way that did not meet with Mr. Craven's approval and early in 1900 he was transferred to another division of the work. For what happened afterwards at Jerome Park, he is in no way responsible. In May, 1900, when the first New York City subways were begun, Mr. Craven joined the engineering staff of the Rapid Transit Commission as Division Engineer, in charge of construction of the division from Forty-first St. and Park Avenue through Forty-second St. and up Broadway to 104th St.; the section through Forty-second St. and under the Times Building being one of the most difficult and delicate pieces of the whole work. He succeeded George S. Rice as Deputy Chief Engineer of the Rapid Transit Commission in 1904, when Mr. Rice became Chief Engineer and succeeded to the office of Deputy Engineer of Subway Construction under Mr. Rice, when the Public Service Commission was organized in 1907. In 1910, Mr. Craven succeeded H. B. Seaman as Chief Engineer of the Commission. Mr. Craven has not only distinguished himself in his 44 years of varied experience as a great engineer and executive, but has gained a reputation as an arbiter and peace-maker in solving the intricate problems in relation to the control and operation of the dual transit system now under construction. For days at a time he has appeared as a witness at the hearings of the Commission and of the courts and has won the respect of lawyers, capitalists, railway-operating officers, and commissioners, not only by the breadth and accuracy of his technical knowledge, but by the clearness and force with which he presented it. Robert Ridgway. Mr. Craven's first lieutenant, Robert Ridgway, was born in Brooklyn, N. Y., Oct. 19, 1862. He lived in Brooklyn and on a New Jersey farm until he was 19 years of age. He never attended a college or technical school. In May, 1882, he went west and joined the engineer corps of the Northern Pacific Ry., serving as chainman, rodman and leveler on preliminary surveys in Montana, and on location and construction in Wisconsin. Mr. Ridgway returned to the east in the summer of 1884 to accept a position as a leveler with the Croton Aqueduct Commission, New York City. For 16 years he was a member of the Commission's engineering staff. His first important assignment was as Assistant Engineer in charge of the construction of the gate-house and appurtenances at the Croton dam and the northerly 1.5 miles of the new Croton Aqueduct, from 1886 to 1890. On the practical completion of this work he was made Assistant Engineer of Construction of Reservoir M and appurtenances, on the Titicus River, which included the construction of a masonry dam having a maximum height of 130 ft., with earth wings 100 ft. in height. Subsequently, he was Assistant Engineer in charge of the construction of the Jerome Park reservoir; serving there under his present chief, Mr. Craven, who was Division Engineer. He followed his chief to the Rapid Transit Commission in 1900 as his Senior Assistant Engineer on the second division. In March, 1903, Mr. Ridgway was promoted to be Division Engineer and was placed in charge of the fifth division, including the construction of the South Ferry loop, the tunnels under the East River from the Battery to Brooklyn and the Brooklyn subway. When the Board of Water Supply was organized in 1905 for the construction of an additional system for the water-supply of New York City, he joined the staff of its Chief Engineer, J. Waldo Smith, as Division Engineer, and was promoted the following spring to the position of Department Engineer in charge of the Northern Aqueduct Department, which included the location and construction of the upper 60 miles of the Catskill Aqueduct. The Hudson River crossing at Storm King Mountain was in his department. Here he continued until the practical completion of most of the work under construction, in January, 1912, when he was again called to serve under his former chief, Mr. Craven, with the Public Service Commission. Daniel Lawrence Turner. Daniel Lawrence Turner was born in 1869. He graduated from Rensselaer Polytechnic Institute with the degree of Civil Engineer in 1891. For a year he was assistant in mathematics at the Institute, and then for three years he was Assistant Engineer in charge of the location and construction of a standard-gage switchback railway near Middletown, Conn., for the Columbia Granite Co. In 1893, he was engaged in railway location work and as Engineer for Ernest Flagg, Architect, New York City. For nine years following, Mr. Turner was Instructor in surveying, railway engineering and hydraulics at Harvard University. While at Harvard he inaugurated the Harvard engineering camp and established and conducted for a number of years the present camp at Squam Lake, N. H. During this period, he was also engaged in private practice with special reference to hydraulic engineering. Mr. Turner, like his Chief and Mr. Ridgway, is also a pioneer New York City subway engineer. His experience in this work dates from the beginning of the subway work in 1900 when he became a member of the engineering staff of the Rapid Transit Commission. During the life of the Rapid Transit Commission, 1900-1907, he served in various capacities, first on the preparation of drainage plans, as Assistant Engineer in charge of stations and in charge of surveys for subway extension to Brooklyn, including the East River triangulation. Later he was Division Engineer in charge of stations. Upon the establishment of the Public Service Commission, First District, in 1907, Mr. Turner became Division Engineer of Stations and Chief of the Bureau of Transit Inspection, in which latter position he originated and formulated the methods of supervising the operation of the various street railways coming under the Public Service Commission's jurisdiction. For a year he was Division Engineer of the seventh division of the new subways, and since 1912 he has been Deputy Engineer of Subway Construction. Sverre Dahm, Principal Assistant Engineer in charge of the Division of Design, was born in Norway, in 1858. His technical education was received at the Polytechnicum, Munich, Bavaria. He began his engineering experience as an Assistant Engineer on the Norwegian Government railways. His first work in America was as Assistant Engineer for Theodore Cooper, Consulting Engineer, New York City. Subsequently he was in bridge and structural work with the Long Island R.R., and with contractors in Chicago and New York City, until June, 1900, when he was appointed Assistant Engineer of the Rapid Transit Commission. Since then he has passed through various grades in the Rapid Transit Commission and its successor, the Public Service Commission, and since 1909, has been Principal Assistant Engineer. Frederick W. Carpenter, Division Engineer of Construction, was born in 1859, and graduated from Cornell University in 1884. For 10 years he was in railway construction and municipal work in the east and middle west. In 1895 he was appointed Assistant Engineer, Bureau of Highways, Brooklyn, N. Y., where he remained until 1900, when he became Assistant Engineer of the Rapid Transit Commission. He continued as Assistant Engineer of the Public Service Commission, and in 1910 was promoted to be Senior Assistant Division Engineer, and Division Engineer in 1913. John H. Myers, Division Engineer of Construction, was born in 1869 and graduated from Rensselaer Polytechnic Institute in 1893. After a few years' experience in general surveying and engineering work in and about New York City, he spent six years as Assistant Engineer with the Department of Water Supply of Brooklyn, N. Y. In 1900 he joined the engineering staff of the Rapid Transit Commission as Assistant Engineer, and in 1906 he was promoted to be Division Engineer, which office he continued to hold under the Public Service Commission. Cornelius V. V. Powers, Division Engineer of Construction, was born in 1860. He is a graduate of the Columbia University School of Mines and his first experience was as a Chemist and Metallurgist for a smelting company. His civil engineering experience began as a laborer with the New Croton Aqueduct Commission in 1885. He was successively promoted through subordinate positions to be Assistant Engineer. In 1900 he joined the staff of the Rapid Transit Commission as Assistant Engineer. He was promoted to be Division Engineer in 1903. Jesse O. Shipman, Division Engineer of Construction, was born in 1868. He graduated from Bucknell University, Pennsylvania, in 1890. The first 10 years of his engineering experience were spent mostly in railway survey and construction work. In June, 1900, he was appointed transitman with the Rapid Transit Commission and a year later Assistant Engineer. In April 1910, he was promoted to be Senior Assistant Division Engineer and in October, 1911, Division Engineer. Louis D. Fouquet, Division Engineer of Sewers, was born in 1867. He was in railway work in the east. From 1904 to 1908, he was Assistant Engineer of the New York, New Haven & Hartford R.R., and had charge of construction of two large Scherzer rolling lift draw bridges, one four track and the other six track. He joined the staff of the Public Service Commission in 1908 as Division Engineer. The Division Engineer in charge of Subsurface Structures is C. N. Green, and George L. Lucas is Division Engineer in charge of Inspection of Materials and Construction. The Electrical Engineer of the Public Service Commission, Clifton W. Wilder, was born in Leominster, Mass., in 1876, and graduated from the Massachusetts Institute of Technology in 1898. For several years he was engaged in various kinds of electrical and mechanical engineering in and about Boston and New York City. He first became connected with the New York City electric railway work in April 1905, as Assistant Engineer of Construction with the New York City Interborough Railway Co. He joined the staff of the Public Service Commission in November, 1907, as Assistant Electrical Engineer, becoming the head of the department in 1909. This position requires not only technical knowledge and experience in electrical engineering, but also the ability to appear as an advocate and expert at public hearings of the Commission.